St. Cecilia, Saint Cecilia, santa Cecilia, Cecilia. 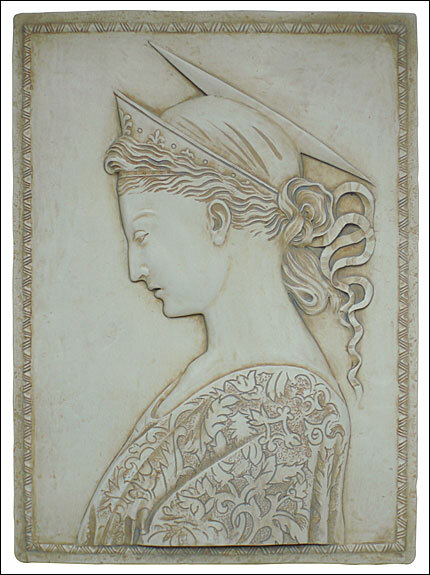 This much admired bas relief of St. Cecilia has been described as "A noble work of art, and divine impersonation of female purity".The delicate line of the profile, the slightly parted lips, the grace and sureness of the line defining the neck and the ribbon that binds the hair are all combined in a charming work of simplistic beauty. St. Cecilia is known as the patron-saint of music and musicians. She has been one of the most venerated maiden martyrs of the early church and is one of those named in the Canon of the Mass. St. Cecilia, born in mid 4th century Rome, was a young patrician woman who vowed her virginity to God, but her parents married her off to Valeriano of Tratevere. She told her husband that she was betrothed to an angel who jealously guarded her body. After the husband asked to see the angel she replied that in order to see it, he must be baptized. He agreed and after returning from the ceremony, he found her in prayer accompanied by an angel with flaming wings, holding two crowns of roses and lilies, which he placed on their heads and then vanished. Valeriano's brother also baptized soon after and the two brothers develop a ministry of giving proper burial to martyred christians. In turn, they were arrested and martyred for their faith. Cecilia buried them at her villa on the Appian Way, and was arrested for this. She was ordered to sacrifice to pagan gods and when she refused, was martyred. Her tomb was opened in 1599 and her body was found in pristine condition.